In an exclusive interview with PakPassion.net, the Pakistan Head Coach Mickey Arthur spoke of Babar Azam's bright future as a key batsman for Pakistan, what Mohammad Amir needs to do to come back to the national side, clarified his position on the issue of a conflict of interest in his association with Karachi Kings and spoke candidly about the reasons for Pakistan's failure in the Asia Cup. PakPassion.net: How satisfying was it for you personally to beat Australia in the recent series? Mickey Arthur: It’s always a lovely feeling beating Australia. As someone who grew up in South Africa and is now an Australian, I know that Australia were South Africa’s greatest rivals. Also having coached Australia and then defeating them here in the UAE was a very special feeling not just for me but for all of us. I was particularly pleased about the very special cricket we played across all formats during the series in the UAE. PakPassion.net: Babar Azam may be doing exceptionally well in the shorter formats of the game, yet his stats in Test cricket seem to be an area of concern. Have you suggested any areas of improvement for him? Mickey Arthur: For Babar Azam, it's just about his confidence in Test cricket. We know that he is a quality player and a very good cricketer in all forms of the game and he will play for Pakistan for a long time to come. If we look back at the Test match against Ireland, he scored a 59 in a pressure situation and was 68 not out when he had to retire hurt after being hit by a Ben Stokes delivery, during the Lord’s Test match against England and he is showing good signs for us. PakPassion.net: Is playing the short-ball a genuine issue for Pakistani batsmen? Mickey Arthur: This is not a problem for us alone, it’s a problem for all batsmen in the world. Batsmen simply don’t like short-pitched bowling and there is no doubt about it. And when such a ball is bowled at 150KpH as Lockie Ferguson was doing during the ODI series for New Zealand, it’s very uncomfortable but that does not mean that these deliveries cannot be played. I feel that the batsmen we have in our Test team all have the technique to counter short-pitched bowling. So, it's not like how the old Asian teams who used to tackle this problem when they went to South Africa or played in England or Australia. They would simply look to stay on the leg-side or fend-off the short-balls or play to slips or to the gully area. Our players now when faced with such conditions go to their off-stump and defend to mid-on. So, technically our players are far better than they were before, and they have been coached better as well. In fact, they are better players in all conditions, so I am very comfortable that our players are well-equipped and have the right tools to face short-pitched bowling. PakPassion.net: Mohammad Amir is not in any Pakistan squad at the moment but what is being done to monitor his progress during his time away from the national side? Mickey Arthur: Mohammad Amir knows what he needs to do to get back into international cricket. I regularly speak to Amir and his coach in the domestic side who has done some good work with him. What he is doing now is following up on information that Azhar Mahmood and I have sent through to him. We monitor Amir’s progress which includes looking at his recent videos from domestic games. Every time he bowls, we look at the videos and send our comments back to him. Let’s be clear about the fact that Mohammad Amir is a quality bowler, he has big-match temperament and I am hoping that we can have Mohammad Amir back in the fold, sooner rather than later provided he gives us the ammunition to pick him. It's runs for batsmen which is the criteria for selection and similarly, it’s wickets for bowlers which are important. If we can get Mohammad Amir swinging the ball again, getting though his action and be very comfortable with the hunger and desire to win games for Pakistan, then Mohammad Amir has a big future with the side. PakPassion.net: Mohammad Abbas has been in phenomenal form in recent times but what's he like to work with and how good can he become in the future? Mickey Arthur: Mohammad Abbas has simply been outstanding. What really impresses me about him is his maturity. He knows his body and his bowling so well. He is like a machine and he knows exactly what to do to get the best results. For coaching staff, it's so good to work with players who know what to do to achieve ultimate success and certainly Mohammad Abbas is one of those cricketers. I have no doubt that he will go from strength to strength and when we go to South Africa, I expect him to be a handful in those conditions. PakPassion.net: Shaheen Shah Afridi has been picked for all three squads but in doing this, is there a danger of burning him out? Mickey Arthur: We will certainly monitor the progress of Shaheen for sure. He has come into our Test squad now and let me tell you that we have bigger plans for him. I think he could be very effective on the wickets in South Africa where you need tall guys who can provide you with pace and bounce and he can easily do that for us. It is highly unlikely that we will see him in too many Test matches in the UAE, but we will be working very hard with him over the next few weeks to get him ready to play a Test match or two in South Africa. But, like I said, Shaheen Shah Afridi is a long-term project for us now. PakPassion.net: Wahab Riaz was brought back into the Pakistan Test squad but struggled. What happens now for him? Mickey Arthur: I would like to give a lot of credit to Wahab as we gave him an opportunity before where had to go away and work on certain aspects of his bowling which he did. He got stronger and fitter and he has the desire and hunger to play for his country. You cannot fault his effort in the way he has gone about his work, but it just didn’t work out for him in the series against Australia. He could not give us the performance we needed from him but certainly the door is not shut for Wahab at all. His energy is fantastic, and he is working extremely hard and I am hoping that we will see him in the Pakistan side in the future. PakPassion.net: How would you respond to suggestions that there is some reluctance to pick Junaid Khan for the national side? Mickey Arthur: There has been no reluctance to pick Junaid Khan at all. He has been a very valuable member of our One-Day squad. Ever since the Champions Trophy, he has been in every One-Day squad we have had with the exception of the tour of New Zealand which was due to injury. In a way, that speaks highly of the bowling stocks that we have at our disposal at the moment as we have the likes of Shaheen Shah Afridi, Faheem Ashraf and Usman Khan Shinwari all within our ranks. On the topic of Usman, let me say that whilst he did not get a game in the ODI series against New Zealand, it is a fact that whenever he plays, he never ever lets us down. So once again, let me stress that the absence of Junaid Khan in our team is a testament to the strength of bowling stocks available to us that what we have created. We have such depth in bowling that I haven’t even mentioned the names of Mohammad Amir and Wahab Riaz who are waiting in the wings to be selected. Coming back to Junaid Khan, let me say that whenever we pick him, Junaid never lets us down. We are in a very fortunate position now where are able to rotate our quick bowlers, so our bowlers are never getting tired. This is important as, let’s be honest, it’s the bowlers who are winning us One-Day games of cricket. Our bowling attack is wonderful and it's one of the better bowling attacks in world cricket and the good thing is that we have a very good nucleus of quick-bowlers who we can rotate as needed. PakPassion.net: Mohammad Hafeez has made a comeback in matches in the UAE but are you convinced that he can also make similar contributions overseas? Mickey Arthur: I cannot speak more highly of Mohammad Hafeez’s comeback to the national side. He has been brilliant, and his performances have been excellent as well. He has been brilliant in the way he has worked and gone about his business and hopefully we will continue to see success for a while from him in the future. From a player who had been left out of the squad to a player who has comeback to win us games in the last few months in the UAE, his performances have been excellent. He has simply been superb in all departments of the game. PakPassion.net: How do you fit Fakhar Zaman, Imam-ul-Haq, Mohammad Hafeez and Azhar Ali into the Test team when all are fit? Mickey Arthur: Well, the short answer to this is, you can’t! Once again, we have an awkward position of players sitting out now who are worthy of place but cannot be accommodated in the playing XI. That is something we are very conscious of and that is creating depth in all departments. So, we can afford to have Fakhar Zaman go away and rest himself and say to him, you have two Test matches off for yourself so get your knee fixed and we will have you back, so you can make some massive contributions in the remaining Test and then in South Africa later. PakPassion.net: Shadab Khan has done really well in recent times but seems to be struggling with an injury, what’s the update on that? Mickey Arthur: Shadab Khan has been playing games with a groin injury for a long period of time so we are giving him a break too. If we keep on playing these young players without a break, they will burn out very quickly so, we have to manage them properly. Now we have put Shadab on a very strict rehabilitation program. He has gone home where he will rest. Then, he will have active rest and then the next seven days he starts rehabilitation work and then he joins up with us. Then he works with our staff to get him ready for our tour of South Africa. As I said, we have created that depth in every department which allows us the luxury to play guys who are fresh and that is a good position to be in at the moment. PakPassion.net: Are you keeping an eye on young pacers like Naseem Shah, Mohammad Hasnain, Mohammad Musa and Arshad Iqbal. If so, what are your thoughts on them? Mickey Arthur: We do keep an eye on the up and coming players like the ones mentioned. Let me tell you a story about Mohammad Musa. We watched Mohammad Musa and Shaheen Shah Afridi on TV bowling around the 140KpH mark during the ICC Under-19 World Cup semi-final against India and that really interested us. So, we invited both of these bowlers at the next training camp we had for the national side. Musa really impressed all of us at the camp and he is very much on the radar. He picked up an injury, but he is part of our tracking system at the moment. Naseem Shah is another bowler who has done exceptionally well and also bowled in one of our camps. As for others I have seen only on videos, but we do rely on Mudassar Nazar who is out there, and I can assure you that our young guys are being tracked and monitored much better now than they ever were before. Mudassar and his team are doing a wonderful job in picking up new talent. If they think the player is good enough, they have him over at the NCA and we all have a look at what he can do for us. PakPassion.net: Ehsan Mani has mentioned that any conflict of interests for PCB staff are being looked into. Does this concern you as you hold the position of coach of Karachi Kings and are also the Head Coach of Pakistan? Mickey Arthur: To be clear, when I signed for the position of Pakistan Head Coach, I was already coach for Karachi Kings, so this is not an issue with my current contract. Now, I would love to renew my contract with Pakistan and when I renew, this will be a point which we will need to sit down and debate upon. For the time being, my association with Karachi Kings and my position as Head Coach is agreed upon and written into my current contract. Let me also add that in my view, there is no conflict of interest at all. As I have said before, I am professional enough to do my job properly. Pakistan is my priority, and for me to be working with other young players, whether they belong to Karachi Kings or to another team, and to seeing them play with or against my PSL side has to be good thing and it makes sense for the national coach of Pakistan to be involved in this type of activity. It allows me a platform to see all the young talent from Pakistan and to work with them. So, I think this is a bonus for Pakistan, and for people who think I am going to be involved in some sort of skulduggery is just balderdash. I am only here for the betterment of Pakistan cricket. I am so passionate about Pakistan cricket that I would never ever put myself in a position where there will be a conflict of interest. PakPassion.net: Is Sarfaraz Ahmed’s workload as captain of all three teams a matter of concern? Mickey Arthur: I can’t speak more highly of Sarfaraz. There have been some media reports about issues between Sarfaraz and myself and I can tell you that we have an unbelievably good relationship. I can’t speak more highly of the job he does as captain of Pakistan’s cricket teams. We know our roles very well and we work very well together and we both have the same vision and direction of where we want to take this cricket team. To give you an example of Sarfaraz’s commitment, recently we had optional net practice before the current Test series and he was out there hitting balls. To me, that shows his dedication, professionalism and desire to succeed for his job and for his country. As long as Sarfaraz is showing that kind of attitude, we certainly won’t rest him. PakPassion.net: What went wrong with Pakistan in the Asia Cup. Some observers felt that the players were not focussed and appeared overconfident? 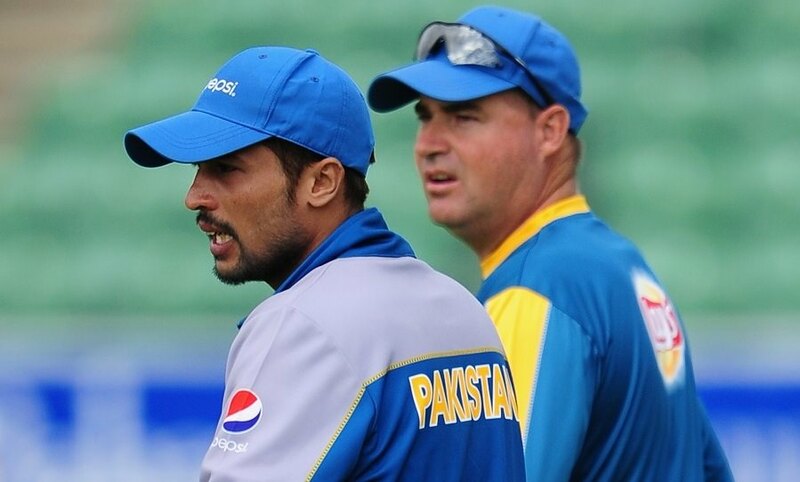 Mickey Arthur: We were certainly very focused, and we trained incredibly hard for the tournament. It was one of the competitions where I saw for the first time a little bit of a lack of confidence within the side. This very young team were playing with a huge weight of responsibility and expectations and we did not deal with that pressure particularly well. Since the Asia Cup, I have been so proud of the way the boys have played their cricket. We sat down and had a proper group conversation about what we did in the Asia Cup. In that tournament, we were scared, and we showed a fear of failure for the first time. But we left all that behind when we played against Australia and New Zealand and this is how this very young Pakistan team will play their cricket in the future. However, there was no complacency or not wanting to do well in the Asia Cup but as I said, this was the first time I saw the players a little bit scared and a little bit of fear but they have come through incredibly well.